There is a great review of this book on the Word Without Borders website, an interview with the author is available on YouTube and on another interview here. I can’t actually recall ever having read as international a book, a book with so many cross cultural and cross disciplinary references within its words and storyline – from Guatemala to the USA to Serbia, from Thelonius Monk to mariachi and gypsy music, from Spanish to Serbian, from Mark Twain to Henry Miller. The book is a series of linked stories, which were translated by 5 translators yet when reading it I could not tell! The book begins fairly realistically, telling of a teacher’s struggles to get his class interested in reading literature - Edgar Allan Poe, Maupassant, Chekov, Hemingway, Flannery O’Connor – and then about his encounters at a highly academic conference on Mark Twain where his comparisons with Cervantes fall on a silent ears except for the aging Twain professor, Joe Krupp. I liked this character with his old man's jokes and witticisms – “what's the difference between a cat and a lie? a cat only has nine lives." But then comes the major change in the writing, there is a pivot point at the chapter entitled Epistrophy (*), after the Monk composition , in which the narrator meets Rakic a wandering pianist. Rakic sends him a series of postcards from his travels and finally the narrator tries to trace him and his roots down in the smoky, seedy depths of post communist Belgrade. 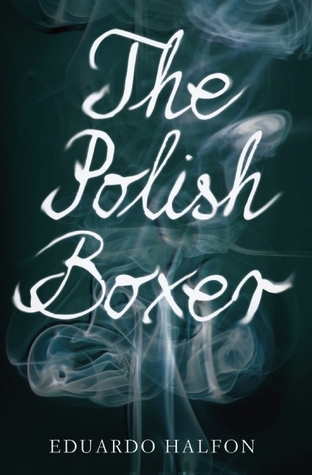 Throughout the novel there are repeated references to the narrator’s Jewish grandfather and his survival from Auschwitz thanks to the wise words of the Polish boxer of the book’s title. There becomes a real mix of real and pseudo real impressions, interpretations and illusions leaving the reader questioning the reliability of the narrator, how much his search for Rakic is in truth a search for his own roots. The teacher in the first chapter describes the difference between a writer and a great writer as "the ability to be saying one thing when in reality you were expressing another, the ability to use language as a means of accessing a sublime, ephemeral metalanguage. I think this is exactly what Halfon himself achieves. This is a book about identity, about the reality of literature, and the transitory nature of these . He asks himself near the end of the book “how is it possible for literature to rasgar (**) reality, to break or tear it. As though reality were a piece of cloth? As though reality were a car window? As though reality were a sheet of paper?” How much of Rakicthe half Serbian, half Gypsy, itinerant, almost ethereal, musician actually Halfon, the English speaking, Spanish writing, with mixed Jewish and Arabic ancestry, born in Guatemala but living in the USA, and how much is Haflon the book’s narrator? As the narrator says “A story is nothing but a lie. An illusion. And that illusion only works if we trust in it.” I clearly did and I was enthralled by this book . It is thought provoking and deeply philosophical. I do hope more of his novels and short stories are translated soon into English. For now 3 more of his short stories can be found on his Words Without Borders webpage. (* ) Note: Webster’s Dictionary defines epistrophe as repetition of a word or expression at the end of successive phrases, clauses, sentences, or verses especially for rhetorical or poetic effect (as Lincoln's “of the people, by the people, for the people”) . (**) Spanish to tear, to rip, but also to strum a guitar.